Desktop Project Part 2: Unicorn, rainbow… soot? This is SH2-284, a star forming nebula. The image is false color, but each hue represents a different part of the infrared spectrum. 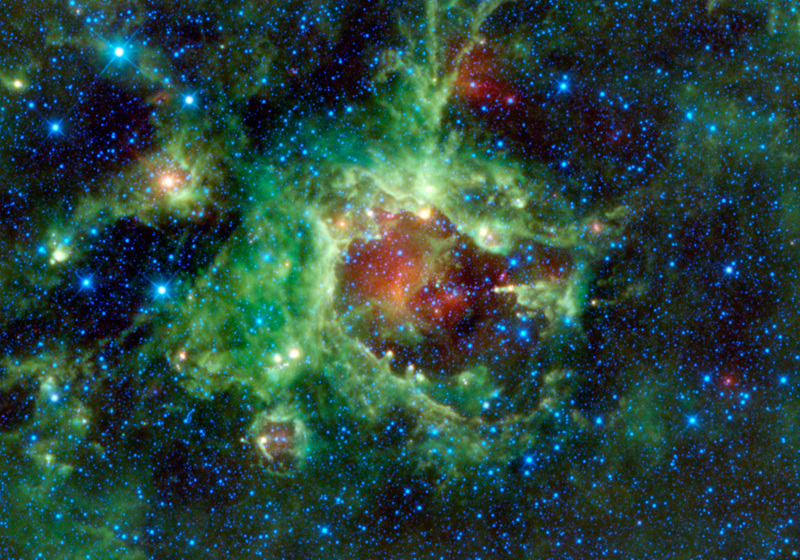 Blue and teal is mostly coming from stars, while red and yellow is dust. Green comes from a very specific kind of material called a polycyclic aromatic hydrocarbons — long-chain carbon molecules which are essentially soot. PAHs are made in various ways, but are abundant where stars are being born, and that’s what we’re seeing here. There’s a cluster of young stars in the center of this cloud, and they’re so hot they’re eating out the inside of the cloud, creating that cavity you can see. Like so many of these structures, the clock is ticking: many of those stars will explode, and when they do they’ll tear the cloud apart. So take a look while you can… this unicorn rainbow cloud only has a few million years left before it’s extinct.